The Omega Plinante Folding Commode features a stable robust frame made from powder coated steel. High corrosion protection with space saving push bar for optimal positioning over the toilet. Swing-away armrests and swing-away, detachable footrests and stable commode seat with integrated toilet pan holder. 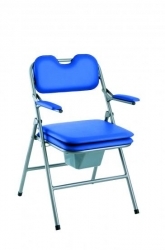 The Omega Pilante commode is a space saving foldable commode with lift up armrests for side transfer. Good quality product , lightweight and folds away when not in use which is great if you are short on space. A very strong , robust commode and easy to clean. I purchased this for when my elderly parents come to visit and its perfect for that use.